The growth of global corporations has led to the development of new business strategies whose complexity and configuration rest on corporate networks; corporate cross-culture and intangible corporate and product assets. In global markets, corporations compete in a competitive marketspace dimension, in other words, competitive boundaries in which space is not a stable element of the decision-making process, but a competitive factor whose complexity depends on markets increasingly characterized by time-based competition and over-supply. In view of today's fierce competition from US and Southeast Asian corporations, this book highlights global business development policies based on innovation, sustainability and intangible assets. 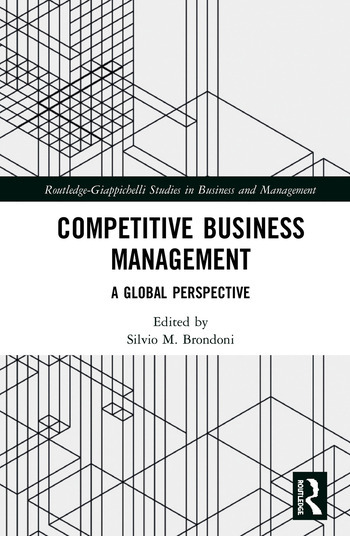 The book assesses competitive business management from a global perspective, examining business development policies linked to the profitability of global firms. It forces readers to actively think through the most fundamental policies developed by global firms in the current competitive landscape and provides answers to questions such as: What are the new drivers of global capitalism? ; How do global businesses deal with new local nationalism? ; Which governance systems and behavioural norms qualify global businesses? ; What are the main business policies that characterize competitive business management in a global competition perspective? Competitive Business Management neatly explains the global business management domain and helps readers to gain an understanding of global development business policies. Acknowledgements, Preface, Part I: Conceptual Framework 1. Competitive business management and global competition: An introduction 2. The sharing economy. A new strategy to compete in the global market. 3. Corporate governance, ownership and global markets 4. Global management and "economic patriotism". 5. Outside-in open innovation in competitive business management 6. Hybrid innovation in global business management 7. Global firms and cross-cultural management Part II: Managerial Issues 8. Destructuring of marketing channels and growth of multichannelling. In search for a new model for distribution systems. 9. Large-scale retailers, marketing channels and competitive customer value. 10. Business coalitions for sustainable global procurement. 11. Competitive pricing and advance selling. 12. Brand strategies and market-driven management. 13. Global firms and new standards of corporate social responsibility. Authors. Silvio Mario Brondoni is Full Professor of Management at the University of Milano-Bicocca, Department of Economics, Management and Statistics, Milan, Italy.